Flushing CSA is excited to be hosting Flushing Eco-Fest on Saturday, March 23, 11am-3pm, at the Flushing Meeting House. The event will feature eco-friendly vendors, educational booths, and fun activities for kids. We are proud to be sponsored by EmPower Solar, an award winning, local solar energy company. Be sure to stop by their booth at Flushing Eco-Fest to learn about your solar energy options. EmPower Solar delivers superior solar and battery technology, maximum savings, and exceptional customer service. Since 2003, EmPower Solar has been the preferred solar provider of over 2,000 New Yorkers and leading businesses, earning an industry-leading customer satisfaction rating. EmPower Solar represents the world’s leading clean technology companies including SunPower as a Master Dealer, and Tesla as a Certified Powerwall Installer. EmPower Solar leverages over 15 years of solar and storage industry experience and record-setting technology. The company employs 70 full-time workers in Island Park and Long Island City and generates millions in economic activity for the region per year. To date, the company has saved its clients over 15 million dollars in avoided energy costs. Businesses and homeowners can choose to own their solar panels or use a finance or a lease to go solar and start saving 30% on electric bills from day one. New York City residents get a $5,000 state tax credit and an additional NYC Property tax abatement when they go solar. The company has also deployed over 100 energy storage systems and two dozen electric vehicle charging stations. Active in LISEIA and NYSEIA, EmPower Solar has played an integral role in accelerating the Long Island and New York region on a path towards clean energy. 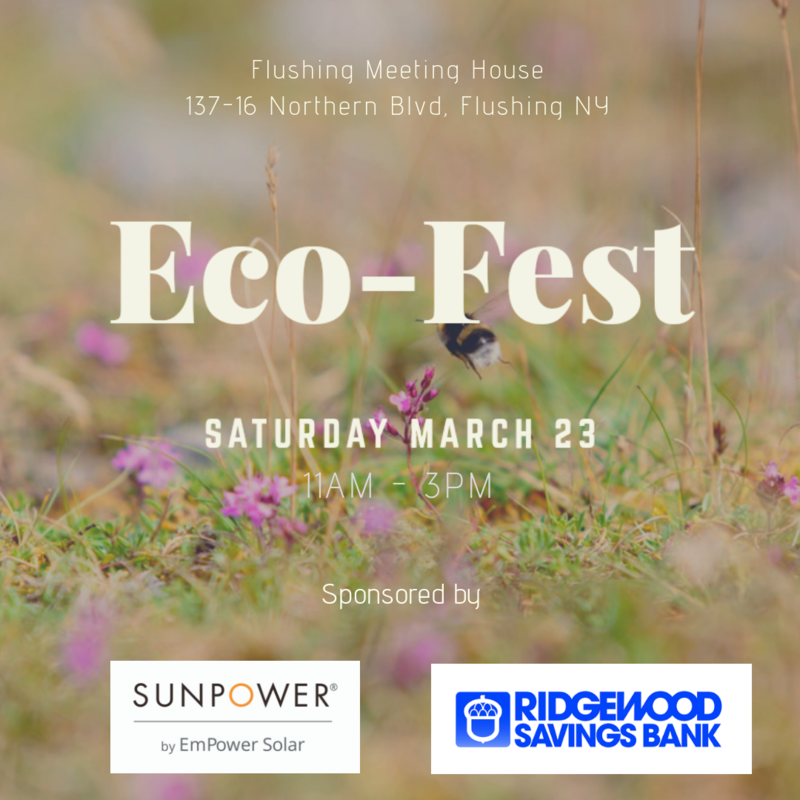 Flushing Eco-Fest will take place on Saturday, March 23 from 11am to 3pm at the Flushing Meeting House located at 137-16 Northern Blvd in downtown Flushing. Tickets are not required and the event is FREE to attend. The event will feature vendors selling local honey and beeswax products, organic spice blends, local eggs and seedlings, home decor products made from recycled objects, as well as freshly baked fruit tortes, herbal teas and handmade soaps, and other green and local vendors. There will also be information booths on local water ways and the importance of watersheds, composting, health care, amnesty efforts, banking, green transportation options, and more. Kids, and kids at heart will be able to create some crafts from recycled household objects. Previous Flushing CSA (February 7) Update! Next Apply for Flushing CSA’s 2019 Season!